Darren Straight's BlogA family friendly minecraft server admin and photographer. This is a absolutely brilliant parody of One Day More from Les Misérables celebrating the recent OneNote Mac launch. It was recorded and produced by the OneNote Engineering Team. A big well done to everyone that took part in this! Minecon 2013 Florida (Mojangs Minecraft convention) is under 2 months away and while I unfortunately wont be going this year I thought I’d share with you the photos I took from Minecon 2012 Disneyland Paris. To celebrate the launch of Skype Prepaid Cards in the UK, Skype have created a mural of over 3,000 Skype Cards with artwork by London street artist Mister Batlow. Lucky Londoners outside Waterloo Station picked up cards with free Skype credit ranging from £2 to £50! These cards now make it easier than ever to call mobiles and landlines, send texts, access WiFi, and most importantly make people smile. They also make the perfect gift. You can pick up the £10 or £20 Skype Cards at the gift card section of select ASDA, Curry’s, PCWorld, Sainsbury’s and WHSmith stores. But wait dont go anywhere yet! I have a something to tell you… see that skype banner at the right hand side of my blog? Well you have a chance to win some Skype Credit! All you have to do is come back on any day from now till the 7th of December 2012 at one of the following times: 10am, 2pm, 5pm or 8pm GMT and play a game… it’s that simple! Good luck, please do let me know how you get one. Today, Microsoft Corp. CEO Steve Ballmer unveiled the customer preview of the new Microsoft Office, available at office.com/preview. The next release features an intuitive design that works beautifully with touch, stylus, mouse or keyboard across new Windows devices, including tablets. The new Office is social and unlocks modern scenarios in reading, note-taking, meetings and communications and will be delivered to subscribers through a cloud service that is always up to date. Office 365 Home Premium — designed for families and consumers. This service also includes an additional 20 GB of SkyDrive storage and 60 minutes of Skype world minutes per month. Office 365 Small Business Premium — designed for small businesses. This service also includes business-grade email, shared calendars, website tools and HD webconferencing. Office 365 ProPlus — designed for enterprise customers who want advanced business capabilities and the flexibility to deploy and manage in the cloud. Full information available here at this press release. The 2012 E3 Expo is right around the corner, and fans from all over the world can look forward to accessing the latest Nintendo news right from the comfort of their homes. Nintendo will be using a mix of online and social platforms to provide a steady stream of breaking news and announcements during the video game industry’s biggest annual trade show, taking place June 5-7 at the Los Angeles Convention Center. Featured content will include the Nintendo All-Access Presentation @ E3 2012, which viewers can access online at: http://e3.nintendo.co.uk or stream via Facebook on June 5 at 17.00 GMT (9 a.m. Pacific time). Fans also will enjoy easy access to news and updates from Nintendo on YouTube, Twitter and Facebook throughout the E3 Expo, including information about the Nintendo 3DS handheld system and the upcoming Wii U console. Twitter: Twitter users can follow Nintendo @NintendoUK & @NintendoEurope to receive tweets directly from the show. Nintendo representatives will also be live-tweeting events such as the Nintendo All-Access Presentation @ E3 2012 on June 5. The lineup of videos will include sneak peeks at upcoming hardware and software as well as interviews with game developers. Facebook: Facebook users can visit and Like the Nintendo page at http://www.facebook.com/nintendo to get regular updates from the E3 Expo and connect with other Nintendo fans. A special E3 Expo tab will make it simple to access E3 Expo content, including video clips and a Nintendo Instagram gallery. The Nintendo @ E3 Expo app will also allow users to stream the Nintendo All-Access Presentation @ E3 2012 and other events on Facebook. Web: Fans can go online to visit the Nintendo All-Access @ E3 2012 website at http://e3.nintendo.com for in-depth information about new and upcoming games and hardware from Nintendo. The site will be optimised for smartphones, so people can keep up-to-date while on the go. Presented annually by the Entertainment Software Association, the E3 Expo attracts video game professionals, journalists, analysts and business partners from around the globe. Additional information is available at http://www.e3expo.com. Bitdefender, one of the world leading global antivirus companies, has released a tool to find and remove the most complex, dangerous spy tool discovered to date, the Flamer attack toolkit. Flamer, also known as Skywiper, can steal data; copy passwords; record voice conversations; create screen captures; and even probe Bluetooth devices near the infected computer. The toolkit, which is thought to have spawned past espionage tools such as Stuxnet and Duqu, can spread through local networks or via removable drives such as USB sticks. Flamer is not a single spy tool, but rather an entire toolbox at the command of attackers. In file size, it is the biggest attack tool yet. Its sheer size means researchers will likely still be analysing Flamer for weeks to discover all of its functions. Reminder: May 31 is the last day to order prizes on Club Bing? As a reminder, games on Club Bing have now ended, but you can still redeem your tickets for prizes through May 31, 2012. Prizes will no longer be available to order after May 31, 2012 at 11:59 PM PDT. Please see Club Bing and Terms and Conditions for more information. If you haven’t done so already, please visit the Club Bing Prize Mall to redeem your tickets*. Please note that prize selection is limited and if the prize you ordered is no longer available, Club Bing may substitute a prize or prizes of comparable or higher value. As an alternative to Club Bing, you can check out Bing Rewards and Bing Entertainment. Bing Rewards: Join Bing Rewards and earn credits when you search with Bing. Redeem credits for Redbox one-night movie rentals, Microsoft Points, Amazon.com Gift Cards and more. Bing Entertainment: Play a wide range of free online games on Bing. Choose from word games, puzzles, action games and more. I’m sure by now most of you know what SOPA and PIPA is? If not I urge you to read up on it! Today the 18th of January 2012 for 24 hours, worldwide, beginning at 05:00 UTC it has been a web blackout in which various sites, including high-profile sites such as Wikipedia and Minecraft.net have be down/blacked out in opposition of SOPA. But are you supporting or opposing SOPA? Or do you not really care? Or don’t understand what it’s all about? Please discuss everything you think about it… should SOPA be stopped? As I have thought since I found out not only about SOPA but also PIPA (Protect Interlectual Property Act) I have thought that they could potentially destory everything everyone loves about the internet. It has been said the internet is already censored in countries like china but the problem these acts bring, not only to their native USA but also to the world in general (as they will cause presidence), it will take the decision of what someone owns from the correct hands of the authorities and the judicial system, and it will place it into the hands of corperations who have already proven to abuse the systems that are currently out there. A case and point is Megaupload. Universal (UMG?) decided that Megaupload was enableing too much piracy (a term which I already have a problem with) and had it taken down. This caused an uproar among the fans of Megaupload who use it for legal things so they made an original song. This song had original lyrics and music and also endorsed and stared many recording artists (all of whom signed saying that their clips/names could be used). This video was posted to Youtube but then UMG seeing this had it taken down. The trouble is that it did not infringe any copyright but it turns out that UMG does not actually need a valid reason to take down someones video on Youtube. This was then taken to court. Vehemently against it. It is a stupid law written by people who have no understanding of the way the underlying infrastructure of the internet works. Blocking sites at a DNS level isn’t effective anyway since these sites can still be visited by knowing the public IP of their server and there are already services such as TOR (The Onion Router) which offer alternative DNS lookups. It will do nothing to combat online piracy and a lot to damage the “free speech” that the US holds so dear. As a UK citizen you’d think that we shouldn’t worry about US laws however if this law gets through then it will set a worrying precedent for the rest of the world. The US has already threatened Spain (successfully) into adopting its own SOPA style law. CyberLink Corp. (5203.TW) today unveiled a new public beta program of its industry-leading photo workflow software, PhotoDirector 3. PhotoDirector 3 Beta can be downloaded for free and includes a wide array of new and improved features, including a complete set of new editing tools such as the Wrinkle Remover, Tooth Brush, Skin Smoother and Object Removal. In June 2011, CyberLink launched the first PhotoDirector public beta program and received feedback from more than 125,000 photographers who participated and inspired a wealth of new improvements and additions for PhotoDirector 3 Beta. With the PhotoDirector 3 public beta program, participants can enjoy exciting new features including a deep set of editing tools that allow users to magically remove objects and people from images and reduce lens defects like geometric distortion. Users can also improve portraits by whitening teeth, removing wrinkles, and smoothing skin and personalizing images by adding watermarks, among a number of other enhancement features. All consumers and photographers that participate in the PhotoDirector 3 Beta program, and complete a survey or report a bug will receive MediaShow 5 (UK £29.99), CyberLink’s media management and slideshow tool, for free, and will have a chance to win a Nikon D3100 DSLR camera. Additionally, users who submit a testimonial describing their experience with PhotoDirector 3 Beta will have a chance to win a Nikon D3100 DSLR camera, PowerDirector 10 and the full version of the official release of PhotoDirector 3 when it’s available in early 2012. To download PhotoDirector 3 Beta, or for more information regarding the PhotoDirector 3 Beta program, please visit www.cyberlink.com/event/phd3beta. 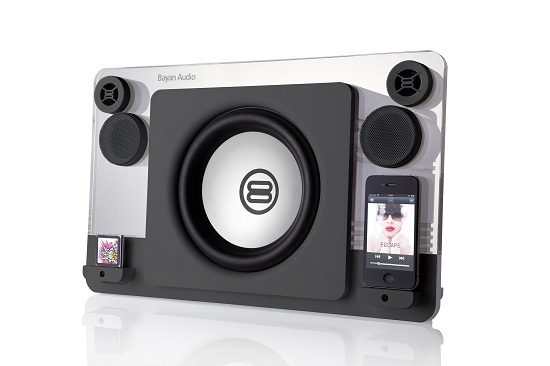 Bayan Audio has unveild its premier iPod/iPhone dock with a world-first twin amplifier set-up driving a monster 120W of sound power. The unique and contemporary Bayan 7 speaker dock for iPod and iPhone delivers balanced, pure acoustics across an impressively wide frequency spectrum1. Effectively squeezing the best out of any audio source it blasts music to a new dimension with superior definition, depth and zero distortion even at high volume. Beautifully designed in the UK, the Bayan 7 is built from an efficient combination of quality, organic materials and sound-enhancing components which result in a truly natural soundstage. The Bayan 7 demonstrably outperforms far more expensive speaker docks2, with a near-flat frequency range allowing even untrained ears to pick out subtle notes they never knew existed in those all-time favourite tunes. Whether you’re into heavy rock, pop or opera, the choice of speaker can make or break the track. Using a designer combination of high-tech 120W twin amplifier technology and a five-way 2.1 channel speaker configuration with 8” rumbling subwoofer, 2” mid-range and 1” tweeters the Bayan 7 delivers a winning combination of a near-perfect frequency range, natural sound and loud yet defined audio. What’s more, certified Apple compatibility with Charge & Play functionality offers total peace of mind that your Apple iPhone, iPod or tablet will keep on going for hours of listening pleasure. Amplifier Quality and Configuration: Twin amplifiers have been carefully engineered to channel complex and broad spectrum sound, delivering a party-pleasing 120W power performance with depth, definition and zero distortion. One amplifier drives four mid/ high-range speakers whilst the second is dedicated to bass output, and both have been built with the highest quality components for the perfect breadth of rich sound. Such premium amplifier technology is usually only seen in products costing upwards of £500 but is integrated into the Bayan 7 and other single-amp products in the Bayan range, ensuring that you can enjoy wide-frequency natural sound reproduction that is noticeably superior to other products with a comparable or even higher price tag. Five-Way Speaker Combination: A five-way 2.1 channel stereo speaker configuration is comprised of an 8” bass speaker for weighty deep notes, two 2” long throw mid-range drivers (which oscillate over a greater distance to provide increased output) and two 1” wide projection tweeters for tight sharp high-notes (each of which has been framed in metal, not plastic). This powerful combination makes the Bayan 7 delicately tuned to offer superb balance and an authentic soundstage, bringing each note alive and creating a realistic representation of where instruments would be on-stage for a live sense of presence in the room. Twin Ports: The Bayan 7 features twin ports on the front for docking two Apple iPod or iPhone devices at once, and allow simultaneous charging of both. What’s more, family members can switch between songs across both devices without swapping docks or files, so everyone’s music taste can be catered for without compromise. Charge and Play: In the fast-paced world of today, battery life will be a concern of the past, with handy Charge & Play supported by the Bayan 7. This time-saving feature works not only with the two iPod/ iPhone ports at the front of the device, but also for any iPad/ tablet connected via the rear 3.5mm/ USBA port too. You can drift away for hours, with the safe knowledge that when you head out the door, the phone or tablet will be fully charged and ready to go. Speaker Housing: Unlike flexing plastic, the rigid 12mm solid wood casing offers not just a design edge, but helps to reduce energy dissipation from the speaker (ensuring it is delivered as sound rather than vibration within the enclosure to produce a far more lucid output) and improves the overall efficiency of the speaker drivers to deliver a wider response. Speaker Quality: The Bayan 7’s quality is driven from the roots; fundamental to this is the use of high grade speaker drivers and materials instead of lower cost components that require digitally-enhancing software. Bayan use cast steel speaker frames that enable the drivers to oscillate far more efficiently and ensure minimal energy dissipation, allowing the speakers to produce the widest range of sound that they are designed for with minimum loss. This intelligent mix of natural and technical components delivers absorbingly pure audio with a near-flat frequency response. The result is a natural, broad soundstage and refreshing when compared to systems using alternative technologies that result in a synthesised sound, which can prove tiring on the ears. Alongside an acoustic experience which delivers your favourite feel-good tracks with full force and emotion, the Bayan also provides a flexible and easy-to-control way to manage your song choices. IR Remote: All Bayan products bundle a IR remote control as standard, which offers full control from the comfort of your favourite listening spot, including track control (play, pause, skip), volume control and mute, adjustment for bass/ treble and the option to put the unit into standby mode simply by lifting a finger. Voice mode: The Bayan 7 allows you to switch from Music to Voice mode, an intelligent option which delivers perfect clarity and more pronounced voice whilst listening to audiobooks, podcasts or radio. The power indicator on the top of the unit will change colour to ensure it is always clear which setting has been selected. Colour: Available in slick black or brilliant white and housed within stunning solid wood, the Bayan 7 promises a contemporary touch for any room inside the home. Materials: Each product in the Bayan range has been designed not just for keen ears, but with the environment in mind too. Eco-friendly materials are used where possible for internal components (all lead-free), so the Bayan range uses much less plastic than many competitors. This green approach runs through every aspect right down to the product packaging, which has been constructed from recyclable card. Even traditional polythene has been replaced by recycled cloth bags for a hint of green luxury. Bayan is an Apple licensed partner, and all systems used to connect Apple devices use authentic Apple parts including certain control components, and the finished product has been tested and certified to Apple standards. What’s more, the Bayan 7 has been approved with Apple’s stringent TDMA Noise Rejection tests, promising stable listening which won’t be interrupted by any irritating buzzing caused by interference from mobile phones and other radio transmitters when in use. This well-known seal of approval and extensive compatibility with a range of devices means you can rest assured and take maximum confidence in the quality and reliability of the versatile Bayan range. The Bayan 7 is £299 inc VAT RRP, and is available from www.bayanaudio.com. Hello my names Darren Straight and I'd like to welcome you to my blog. I'm a Network Manager with a passion for new technology, in my spare time I run a family friendly minecraft server called YAMS (Yet Another Minecraft Server)..
My names Darren and I'm an ICT Technician and blogger, my hobbies include walking, photography and generally exploring new places.